Software-defined radio (or SDR) is a relatively new (to average tinkerers, at least) way of sending and receiving radio signals. The interest in SDR exploded recently with the realization that cheap USB TV tuner cards could be used to start exploring the frequency spectrum at an extremely reduced cost. One of the reasons that this is so advantageous is because of all of the options that a general-purpose computer opens up that go beyond transmitting and receiving, as [Chris] shows with his project that ties SDR together with GPS. There are a lot of opportunities here for anyone with SDR. Maybe an emergency alert system that can tune to weather broadcasts if there’s a weather alert, or any of a number of other captivating projects. As for this project, [Chris] plans to use Google’s voice recognition software to transcribe the broadcasts as well. The world of SDR is at your fingertips to do anything you can imagine! And, if you’re looking to get started in it, be sure to check out the original post covering those USB TV tuner dongles. If you’ve lost interest in that DVB dongle you bought to give software defined radio a try you should bust it back out. [Harrison Sand] just finished a guide on how to use SDR to listen in on Police and Fire radio bands. The project, which results in the crystal clear audio reception heard after the break, uses a whole lists of packages on a Windows box to access the emergency bands. SDRSharp, which has been popular with other DVB dongle hacks, handles the hardware work. In this case the dongle is a Newsky TV28T v2 module that he picked up for a few bucks. He’s also using some support programs including the Digital Speech Decoder which turns the data into audio. We wonder how many areas this will work for. It was our understanding that law enforcement was moving to encrypted communications systems. But all we really know about it is that you can jam the system with a children’s toy. Here’s an interesting hack. It’s a small pick-up truck with a Dope Cannon attached to it. Sure, it looks more like something you’d see in Syria, but this item was actually seized in Mexico where it was being used to fire 30 pound slugs of Marijuana over the border fence with the US. Usually when you fire artillery there isn’t someone on the target range trying to recover the projectile! The device uses a PVC barrel to guide the pot-pellet as it’s propelled by compressed air. Hey, swap out the drugs for an energy drink and that sounds pretty familiar. Our qualifying entry for the 2012 Red Bull Creation Contest was an energy drink cannon which used the same setup with a slightly smaller caliber. It makes us wonder if the drug cartel uses little parachutes like we did? Doesn’t it arouse suspicion to drive something like this around town? You’d think they’d use a box truck or something similar to hide the giant gun. When then folks from the MakerShed had a laptop and iPad stolen from their vehicle in Detroit, they found out several important things. The Detroit police have more important things to pursue. You never know how your adventure will end. Luckily they were using an online backup system that offered location services as well. While many may disable these prying eyes as a matter of principle when they join, this is one scenario where you’d be happy you had it. As it turns out, the Detroit police were fairly busy with other things and left the laptop owners to their own devices tracking the stolen goods via the internet. Some fun and interesting detective work involving Google maps, craigslist, and backed up images ended up leading them to the stolen goods. Once they had a physical address, the police were available to check things out… well, a few days later. When they went to the address with a search warrant… and a battering ram, they found the house lacking tenants, but containing several forms of ID, a stolen laptop, and some Marijuana meant for distribution. The entire story is interesting, especially the fact that the amateur detective work was capable of providing enough information for a search warrant. This actually makes me wonder how easily one could fabricate all of this information falsely to cause trouble to an innocent person. It looks like it would only take about 15 minutes and some photoshop. Maybe that’s a conversation best left for another time. [Nathan], a member of the DangerousPrototypes forums, was looking for a project he could use to enter the 7400 logic competition they are holding. 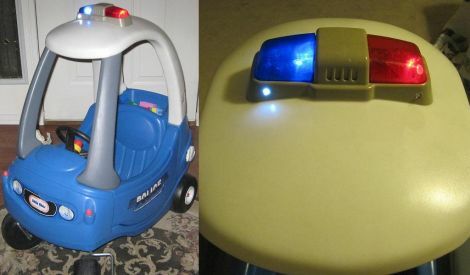 His kids had a small ride on police car, but the light bar on top contained no lights, and the car made no sounds when his children were in pursuit of baddies around the house. [Nathan] had all the inspiration he needed, and took to his workshop in order to fix this glaring oversight by the toys’ creators. He designed a circuit based loosely around a Cylon-style light that he saw a while back at the Evil Mad Scientist Labs, which employed an oscillator and a 4107 decade counter to control the lights. His design uses a 74HC04 hex inverter as the oscillator, while the decade counter is used to modulate the siren’s frequency and control the rotating LED beacons. The final result is great if you ask us. An “unnamed adult female” in the house was not nearly as impressed by the additions based upon how much time [Nathan] spent on the project, but his children were absolutely thrilled. Continue reading to see a quick video of the revamped police car in action. [Blacklight99] made this cool tool. It is a tester for those radar detectors that people keep in their cars. Though this seems like it would rarely be a tool we would need, it’s an interesting project. Some speed guns that the police use have a “stealth” mode that makes them invisible to some detectors. This tool can tell you if your detector is vulnerable to this. While this really is just a complicated flashing LED, he notes that it could be taken further to be made into a detector that is programmable and not vulnerable to any of the stealth modes. South Wales Police raided a store in Cardiff seizing 1,800 Nintendo DS flash carts. The devices can be used for playing pirated games or running homebrew software. In the UK, the carts are illegal under the Trademarks and Copyright Acts. The 21-year-old suspect had imported the devices and was selling them both online and in-store. He had over 1,000 devices in his home. Many of them packed and ready to ship. Official statements by the Entertainment and Leisure Publishers Association claim that the hardware irreparably damages the DS handhelds.